Canadians are richer than ever before, with Toronto, Calgary, and Victoria joining Vancouver now cities of millionaires, according to a new report. The Wealthscapes study by marketing and analytical services company Environics Analytics, looked at average household net worth across Canada in 2016. The net worth is defined as the value of liquid assets (cash or savings, for example), employer pension plans, and real estate, minus debt – including mortgage debt. According to the report, Torontonian households now have an average net worth of $1,154,107, up 17% from last year. Meanwhile, Victorian households were esimated to have an average net worth of $1,055,468, and increase of 15.4% from last year. 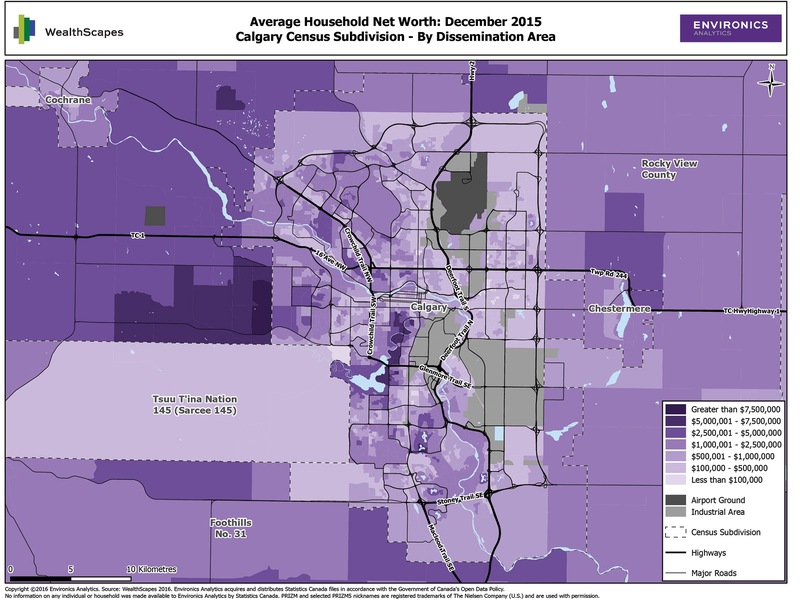 And Environics says Calgarian homes have an an average net worth of $1,039,607, a rise of 9% over last year. Where are the millionaire households? 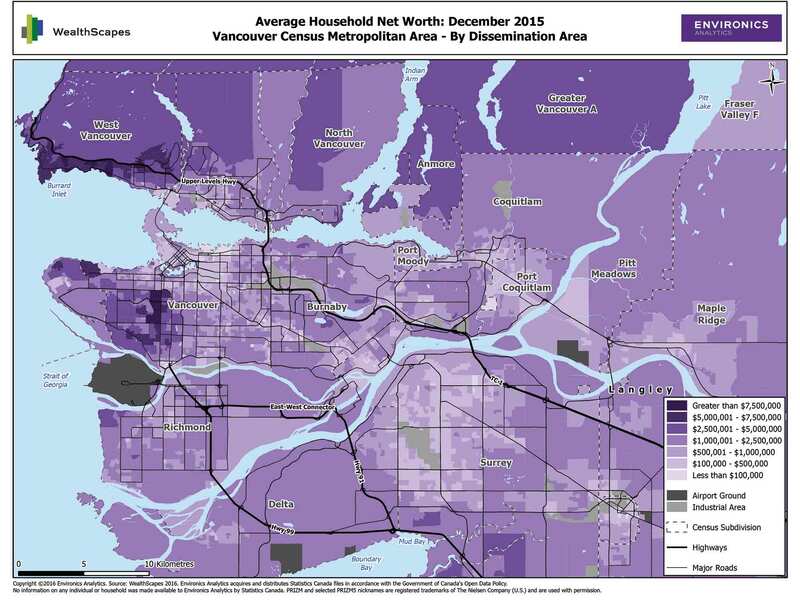 To see exactly which neighbourhoods in your city are apparently full of millionaire households, take a look at the maps below. The darker the purple, the richer the neighbourhood. Peter Miron, vice president of demographic and economic data at EA and the lead developer of WealthScapes 2017, attributes this all to a range of factors. “Strong performance in the stock market buoyed Canadian investments,” said Miron in a release. “The biggest housing markets experienced strong real estate appreciation. Last year, Vancouver was the first Canadian city to be added to the Environics “millionaires club,” then with an average household net worth of $1,036,202. This year, that figure rose a massive 19.4%, with Vancouver’s households now estimated to have an average net worth of $1,217,630. And for the first time, British Columbia is now a “province of millionaires,” with an estimated average household net worth of $1,024,042. Overall, about 3.2 million households—or 22.2% of Canada’s 14.4 million households—are now reportedly in neighbourhoods with a net worth above $1 million. Across Canada, the report found, average household net worth rose 12% over the previous year to $770,635, with household debt rising only 4.4% to an average of $139,387. But the report concedes, the gap between rich and poor is widening. According to Environics, in the wealthiest neighbourhoods, net worth grew by 14.1% to $1,790,588, due to strong performance of real estate and the stock market. But in the poorest neighbourhoods, the report found, net worth only grew 7.5% to $206,765, with households there having little real estate or stock holdings. It’s worth noting too that almost half of Canadian workers are still living from paycheque to paycheque, according to the Canadian Payroll Association.